Mr Stokes is a busy man. He may be driving through the night to film some promo clips for his wetsuit sponsor , jetting off to the other side of the world to capture his dream life, or simply busying himself with renovating his new home. Sam Lamiroy pounced on him when the opportunity arose, to score a few waves and find out more about the UK’s most in demand surfer. As with all great days, a few strands of good fortune aligned. 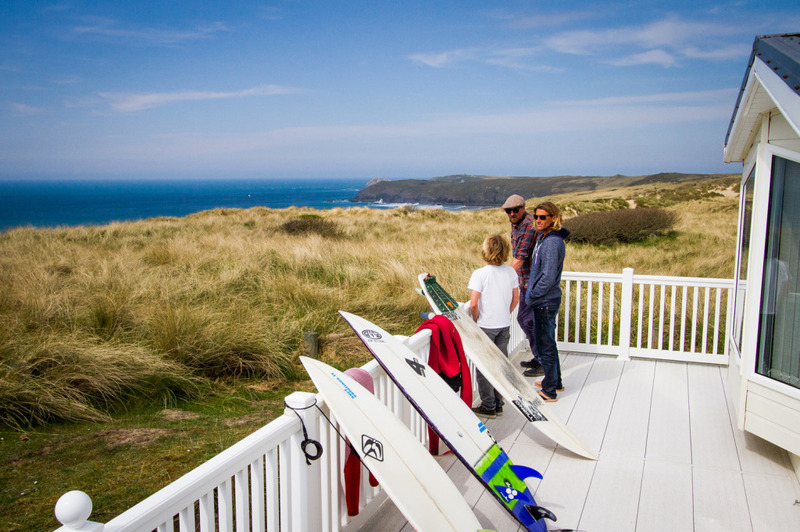 We had a talented crew, including Max Hudson, a promising up and coming young surfer from Newquay, who was keen for a surf and some tips. The waves and wind were right and we’d heard rumours of good sandbanks. We also got an invite from the fine folk over at the Perran Sands Holiday Park to come and hang out after and make ourselves at home in their guest lodges. 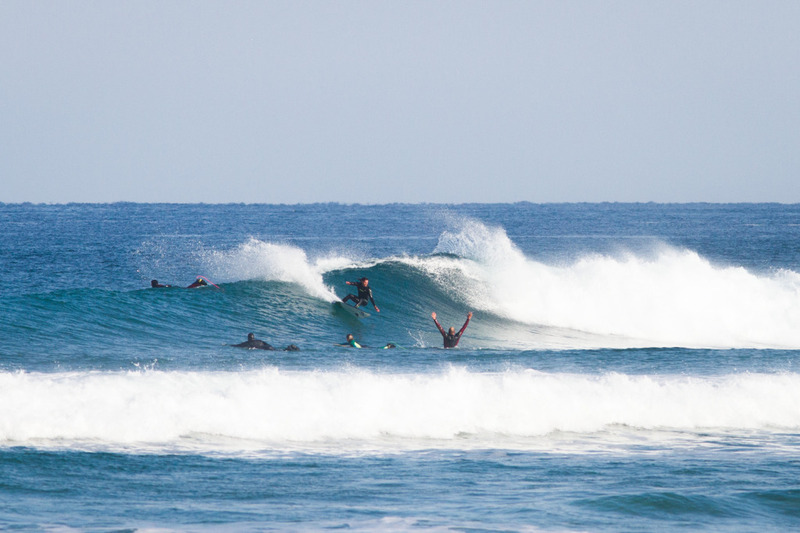 We had a base, we had waves and we had surfers; it was time to get in the water. Once again Stokes showed why he is one of the most successful UK surfers of all time and a marketeer’s dream! His surfing was crisp and innovative, but most notably he’s channeling a lot more power into his turns and keeps his rail in the water for longer than I’ve ever seen him do before. His turns are bigger now, more impressive, they fill a wave. Damn. It’s going to be even harder to beat him now! And he is still just such a nice bloke with it. A class act! After our surf, which you can see from the photos, was firing, we took lunch at Perran Sands and discussed a whole array of things, which started a bit like this…. Sam: Let’s start real easy and work up into a lather later! Where were you born and where did you grow up. Alan: BasingSTOKE … (Stokes putting the STOKE into Basingstoke there) and I grew up in Newquay where I started surfing when I was six. Sam: So far so good. Now, can you describe your surf career in a nutshell: notable highlights and such. Alan: Highlights for comps would include my British titles and UK tour titles and finishing 2nd in the European Pro Junior tour and 3rd in the European mens in Ireland. Winning the Pantin ASP expression session and the inaugural ASP air show in Ireland. And coming 3rd in a WQS in Portugal on a firing right point and to be in the final with Russ (Winter) who I’ve looked up to from a competing standpoint, that was special. Non-comp highlights would be travelling to some remote but beautiful places in the world, Papua New Guinea was a favourite and working with charities and organisations to help the environment and the people who share it as a home. Sam: Do you have any easy advice for groms, like how can you make a living out of surfing? Alan: Practice makes perfect, so get really good at it. Don’t kid yourself, ask yourself the hard questions, be realistic, how good are you? How much better could you be? Focus and work hard and then push your limits and always try to improve, if you’re good enough the rest will fall into place. Simple. Sam: How do you spend your days, like when you’re on a trip? Alan: Surfing, eating and stretching, playing my guitar, taking in the sights and meeting the local crew. Observing life and all it entails. If I’m in a developing country I like to watch how these people live, what they do and how can their problems like water quality and pollution be helped and improved. Sam: And when you are at home? Alan: Pretty much the same, I’m more focused on my music at home though, although I’m renovating a house that we moved into last year. So that takes up a lot of my spare time at the moment. Sam: You are getting older but still look young and have an awesome rig what are your secrets and thoughts on good health? Alan: Ha ha. It’s all in your mind, that’s where it starts anyways. I’ve looked after my mind and my body, my perception of what is in life keeps me energised and happy, that keeps me active and healthy on a physical level. Diet is also super important, I’m basically a vegetarian so heaps of fruit and veg, unless I find fish that has been sustainably sourced; which basically translates to a hand line caught fish from the fishermen down the beach. Sam: Sounds like you are very much winning at the moment, but how long can this go on? Does the career of a pro surfer have a best before date? Alan: I’m not sure. It’s a personal life journey for me, I don’t see it as a job, never have! I think right now I’m surfing better than I ever have so I’m stoked and the fire is lit. I’ll let my videos be the telling test I guess. That has always been my underlying motivation to be a better surfer. Comps are fun and it’s a great way to test yourself physically and mentally and that has helped me a lot in normal day life. But with the age of internet video I have been able to really focus on my ability on a wave and I use it as a measuring stick. I watch what my body is doing where I am on a wave where I could have gone and what I’ve done wrong. I make a sort of insty vid in my head of how I want that particular turn or air to look or fit on a wave. And then the next time I’m filming I go do it, and the process starts again. In my opinion there are a lot of facets to be coming a really great surfer, someone who can paddle out in any surf and really apply themselves to riding a wave with speed flow and power. It’s a dance and when done correctly, looks effortless. The surfer almost becomes invisible like they were always supposed to be there. Sam: Earlier, I saw that you’re surfing with more power of late, and burying the rail through longer arcs, while still throwing plenty of airs. Would you say that’s an accurate description of where your surfing is at and how does that relate to your boards? Alan: Yes, me and Luke at Fourth went right to the outer limits of say an air board maybe four years ago, because that was something I was really focusing on in my surfing. The boards naturally got shorter wider and flatter and we ended up with the StokaPop board that was 5’3 or 5’4 with this cool bat tail. That board was awesome for airs, really fast and heaps of nose area to land on. From that point we have gravitated back towards traditional shortboards, just to be able to surf with more power and add more radius to turns. Now, we are at the Shovel model boards that I’m riding right now. It’s as close as we can get to a shortboard without loosing all of that fun stuff you get with the shorter wider boards. The board I’m riding right now, I feel I’m doing my best surfing on and I’ve had it a year. This board has been ridden in everything, it’s a truly magic board! I have no idea how it is still in one piece but I like to think that there’s a reason it’s still holding on. Everything happens for some sort of reason. I’ve had that board so long now I’m connected to it on a really spiritual level. This all sounds like mumbo jumbo hippy stuff but if you really want to get the best out of yourself you better learn to open some of those mental barriers that are stopping you from feeling it. Sam: Zen and the art of surfboards! So what boards are you riding in different waves, anything alternative in there? Alan: Well I’ve stuck to the magic one in most conditions from say 3ft to 5ft onshore and offshore. Anything below 3ft and I’ve got a nice twin keel fish that loves going fast and draws a nice curve on a wave face. I’ve also got a nice nose rider for those cruisey 1ft most perfect mini wave you have ever seen days, my dad froths on surfing just as much as me and rides a longboard so it’s always nice to go cruise with him. When it gets over 5ft then I have a 5’11 step up quad that just gets me in and under lips when it’s hollow. It’s a really fast board in the tube and performed really well at 6ft to 8ft Thurso those long fast tubes; that’s when it really comes alive. Sam: A nice selection, sounds like you are keeping it fresh! So what are your plans for the future? Alan: Just to enjoy life and the loving, wonderful people around me and my surfing progression as much as possible. Sam: Do you have any upcoming projects you’re excited about? Alan: They are all top secret but obviously The Wave in Bristol is an exciting project I’m involved in. Sam: So what will the life of a 60 year old Stokes look like? Alan: In a word…. Yeeeeeeeeeeeeeeeeeeeeew!! Sam: Finally it was ace to spend a day with you getting a few waves. Any reflections on the day? Alan: Always a pleasure mate! Errmm, well it was great to get such good waves. I love it over at Penhale especially when the banks are so good, so many waves up and down the beach. It was also great to hang out with Max (the grom) he really impressed me with his surfing. He has great composure on a wave for such a young kid. When we went for an evening surf at Fistral, the kid refused to give in even after I said to him maybe it’s a little to big for you and sent him in after a few fairly heavy waves rolled us. 15 minutes later I saw him paddle straight back out. Sam: Ha. I might have had something to do with that. I saw him on the beach and told him to get back out there with me; it was pretty heavy actually. Alan: That was cool. It was probably three times over head for him and plenty of raw, new swell power. Good skills Max, you impressed me mate. Sam: Glad it all worked out okay. As they say: ‘All’s well that ends well’. Is there anything you think I may have overlooked? Alan: Nope you nailed it. Sam: Too kind young sir. Thanks for your time and be careful up those ladders when you are painting your house. Think Karate Kid while painting: fence up, fence down. Ha ha.